After Chatzimanolis and Ashe 2005. The xanthopygine staphylinid beetle genus Philothalpus occurs in tropical rainforests and montane tropical forests from Nicaragua to Brazil, Paraguay and northern Argentina. Its habitat is unknown since it has been collected mostly in flight intercept traps, leaf litter or other baited traps. Even though these beetles have very striking appearance, they are represented by very few specimens in museum collections around the world. Currently there are 21 species included in the genus. These moderate sized staphylinids are among the most distinctive of the subtribe Xanthopygina. Most species in the genus exhibit dramatic coloration and punctation patterns. For example, the head and pronotum in P. portokalis is bright orange, in P. porphyros very glossy purplish black, while in P. chloropennis shinning reddish brown. Some species have head and pronotum with dense micropunctures and few large punctures (e. g. P. antennaria), some with fewer micropunctures but with very dense large punctures (e. g. P. porphyros), while others exhibit almost no micro- or macropunctures (e. g. P. chloropennis). From left to right, head and pronotum of P. porphyros, showing the remarkable punctation pattern and coloration. © 2004 James S. Ashe. 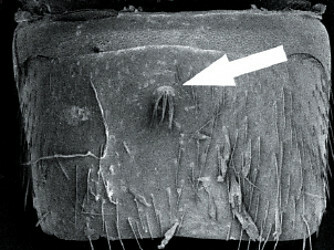 male secondary sexual characters with a porose structure on abdominal sternum VII (see image below), surface of porose structure covered with 10-15 setae. Male abdominal sternum VII. The arrow points at the porose structure. © 2003 James S. Ashe. A morphological analysis of 43 characters from the adult morphology of the 21 ingroup taxa resulted in three equally parsimonius trees. The tree shown above is the strict consensus tree of the three trees. The monophyly of Philothalpus is supported by high Bremer support and bootstrap values and many unambiguous synapomorphies. The available character set cannot adequately resolve the sister group relationships among the species P. chotaenus, P. equadorensis, P. loksos, P. porphyros, P. portokalis and P. stravos. These species are all distributed close to one another in Equador and Peru. The genus was described by Kraatz (1857) and originally included four species: Philonthus fervidus Erichson, Philonthus egregious Erichson, Philonthus viduus, and Philothalpus anceps. P. fervidus had been placed in the genus Eugastus along with E. bicolor and E. mundus by Sharp, and Herman (2001) placed these three species together in a more limited concept of Philothalpus; consequently Eugastus became a junior synonym of Philothalpus. Herman (2001) transferred the remaining species originally assigned to Philothalpus to Oligotergus Bierig, originally a subgenus of Philothalpus, and raised Oligotergus to generic rank. The genus Allostenopsis was described originally by Bernhauer (1907) as Stenopsis. Bernhauer (1921) later realized that the name Stenopsis Bernhauer was preoccupied and proposed the replacement name Allostenopsis. Within Allostenopsis Bernhauer placed two species, A. antennaria and A. kraatzi Bernhauer. The species of Allostenopsis, Eugastus, and Philothalpus fervidus (the type species of Philothalpus) share similar unique diagnostic features (see Characteristics). Consequently, Allostenopsis and Eugastus became junior synonyms of Philothalpus. 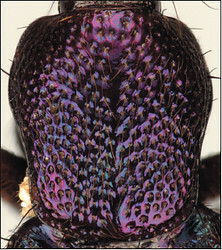 Chatzimanolis and Ashe (2005) described 17 new species and revised the genus. Bernhauer, M. 1907. 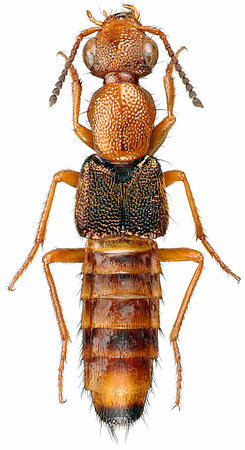 Neue Staphylinidae aus Südamerica. Wiener Entomol. Z. 26:281-289. Bernhauer, M. 1921. Zur Staphylinidenfauna von Südamerica. Dtsch. Entomol. Z. 1921:65-77. Blackwelder, M. 1943. 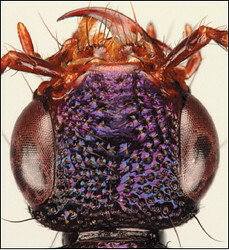 Monograph of the West Indian beetles of the family Staphylinidae. United States National Museum Bulletin 182:1-658. Chatzimanolis S. and J. S. Ashe. 2005. Revision and phylogeny of the neotropical genus Philothalpus Kraatz (=Eugastus Sharp and Allostenopsis Bernhauer) (Coleoptera: Staphylinidae: Xanthopygina). Insect Syst. Evol. 36:63-119. Herman, L. H. 2001. Nomenclatural changes in the Staphylinidae (Insecta: Coleoptera). Bull. Am. Mus. Nat. His. 264:1-83. Kraatz, G. 1857. Naturgeschichte der Insecten Deutschlands. Abt. 1. Coleoptera. Zweiter Band. Lief. 3-4. 377-768 pp. Nicolai, Berlin. Darci Falin prepared the title illustrations. Page: Tree of Life Philothalpus. Authored by Stylianos Chatzimanolis and James S. Ashe (1947-2005). The TEXT of this page is licensed under the Creative Commons Attribution License - Version 3.0. Note that images and other media featured on this page are each governed by their own license, and they may or may not be available for reuse. Click on an image or a media link to access the media data window, which provides the relevant licensing information. For the general terms and conditions of ToL material reuse and redistribution, please see the Tree of Life Copyright Policies.